United States Senator Thomas Carper (D-DE) will address a joint meeting of MIT Club of the Delaware Valley and Delaware Section of the American Chemical Society to cover topics in the realm of science and public policy. Science and technology are critical components of several topics of current national interest. In particular, public policy addressing energy independence/security and environmental concerns (such as hurricanes and climate change, etc.) requires the knowledge of the scientists and engineers who study the technical underpinnings of these challenges. MIT President Susan Hockfield and American Chemical Society Past-President Katie Hunt have both emphasized the importance of advocacy by members of the scientific community to influence the construction of sound public policy. (Important note: This meeting is to inform our members about the state of science legislation; as a tax-exempt 501(c)(3) organization this Club does not engage in any advocacy or lobbying activities). Senator Carper was born in West Virginia and raised in Virginia. He attended The Ohio State University on a Navy R.O.T.C. scholarship, graduating in 1968 with a B.A. in economics. After serving as a naval flight officer in Southeast Asia during the Vietnam War and later as a P-3 aircraft mission commander, Tom Carper returned to Delaware in 1973 where he earned his M.B.A. at the University of Delaware. 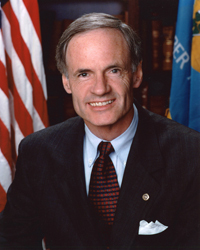 On January 3, 2001, Thomas Carper became the junior Senator for the State of Delaware. He was re-elected to the United States Senate on November 7, 2006, making him the winningest politician in Delaware’s history, having been elected to state-wide public office a record 12 times. Senator Carper previously served five terms as a United States Congressman (1983 – 1992) and was a two-term Governor of Delaware (1993 – 2000), during which he served as the Chairman of the National Governors’ Association (NGA) and was a member of Amtrak’s board of directors. For the 110th Congress, beginning in January of 2007, Senator Carper gained a seat on the Commerce, Science and Transportation Committee. He retained his assignments and seniority on the Banking, Housing and Urban Affairs Committee, the Environment & Public Works Committee, and the Homeland Security and Governmental Affairs Committee, as well as the Special Committee on Aging. Payments are used entirely to cover event expenses and are not used for political purposes. If you already have an Infinite Connection account use the "Login" section. If you don't have an Infinite Connection account use the "Non IC Account Registration" button. Note: FRIDAY October 10 -- Change in Date! How and where will this Presidential election be won? What strategies – obvious and not so obvious – are the different parties using to win your vote? What do they know – or think they know – about you demographically? Join us as Dennis Powell shares his insights on this ground-breaking election. Dennis is an experienced strategist with a unique perspective on the language of politicians. He founded Massey Powell, an issues management consulting firm, in 1984, with its business focus to help clients shape and manage public issues resulting from shifts in public opinion, changes in public policy and social, political, and economic trends. Such changes as these can create opportunities or pose threats to an organization’s objectives. Dennis is a dynamic speaker who will provide insight into the stories behind the stories that have resulted in a truly unique election climate and unconventional picks by both major parties. He will address such issues as: How did Hilary lose, and why was she not the choice for Vice President? Who are the real powers behind Obama? Why Sarah Palin? What is at stake in this election? Where should we be focusing our attention? Dennis Powell was born and raised in Philadelphia. He took his bachelor’s degree from LaSalle College where he majored in History with a minor in Philosophy. He earned his M.Ed. from Temple University. Mr. Powell worked as an educator in the Philadelphia School System where he was assistant head of the Social Studies Department. He was retained as an author for Harper & Row to work on the textbook, Economics Today and Tomorrow. 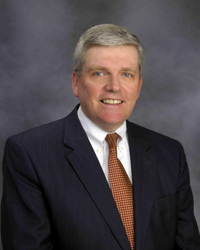 He has served as Vice President of the Colonial School District in suburban Philadelphia and has lectured and worked with school districts on managing key issues. Mr. Powell has consulted as a strategist on hundreds of national, statewide and local campaigns, including those at the Governor, U.S. Senate and U.S. President levels. His firm services clients in the fields of health care, infrastructure, cable and telecommunications and energy. More information can be found at masseypowell.com. If you don't have an Infinite Connection account go through the "Register" section. Auburn Heights Preserve "Steamin' Weekend"
Take a step back in time to a simpler age! Come and experience the turn of the twentieth century through the magic of steam locomotion at the beautiful Auburn Heights Preserve! Enjoy a stroll, or sit under the spreading limbs of the mighty oaks and poplars which surround the estate grounds. You won't want to miss seeing the largest collection of Stanley Steamers you're ever likely to see! There are over a dozen Steamers -- All fully restored and in roadworthy condition. 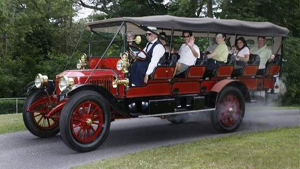 Hop aboard the "First Bus" in Delaware -- A Stanley Mountain Wagon -- for a spin around the property in the fully restored Stanley Steamer 1915 Model 820 Mountain Wagon. Also featured is the small -- but mighty -- Auburn Valley Railroad! This 1/8 size railroad boasts two live steam 4-8-4 Northern Locomotives. Also there is free Steam Popcorn! Please join us for a light lunch (sandwiches, chips, slaw, soft drinks & cookies) and tour of the Auburn Heights Preserve. Look for the MIT tent or area when you arrive. We suggest that you bring a blanket or folding chairs. From Philadelphia: Go South on I-95 to Delaware Exit 7B (Delaware Ave). Turn right on Delaware Ave and follow State Hwy 52 north. Continue on SR-52 (Kennett Pike) 4.9 miles to SR-82. Turn left on SR-82 for 5.2 miles to the Auburn Heights. From Philadelphia Western Suburbs: Take US202 South to Route US1. Turn right onto Route US1, and continue 8 miles to Kennett Square exit off US1. Turn left onto McFarland road for 1.5 miles to Creek Rd/PA-82. Turn left on Creek Rd/PA-82 for 2.4 miles to Auburn Heights, just across DE/PA state line. From New Jersey: From Delaware Memorial Bridge, take right exit off I-295 to I-95 south. Take immediate exit to Newport/Lancaster and SR-141 North. Continue 2.3 miles to Kirkwood Hwy and take exit toward Newark. Turn right from Kirkwood Hwy onto Newport Gap Pike (SR-41 North), continue 5.0 miles to Yorklyn Road. Turn right on Yorklyn Rd for 1.9 miles. Turn left on Creek Rd/SR-82. Continue 0.2 miles to Auburn Heights. From Delaware (Wilmington & North): Take Delaware Ave and follow State Hwy 52 north. Continue on SR-52 (Kennett Pike) 4.9 miles to SR-82. Turn left on SR-82 for 5.2 miles to the Auburn Heights. From Delaware (South of Wilmington): From Kirkwood Hwy, take Newport Gap Pike (SR-41 North), continue 5.0 miles to Yorklyn Road. Turn right on Yorklyn Rd for 1.9 miles. Turn left on Creek Rd/SR-82. Continue 0.2 miles to Auburn Heights.